This is the campsite at the Leeds festival. Why so much litter? Perhaps there weren't enough litter pickers I hear you say? But there weren't any litter pickers at this campsite, they weren't needed. Where there is a culture of respect, where nobody drops litter then all (or most) follow suit. 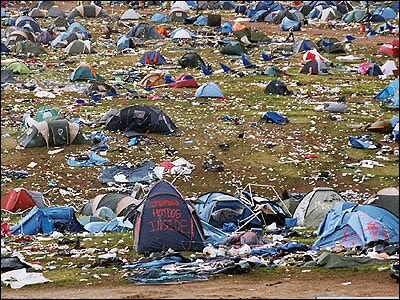 I saw posts of people I know from music festivals laughing about the litter, burning tents, mess and destruction. They aren't normally people who would behave so badly, so why do they do it in those circumstances...because everybody else does, that makes it ok.
Well I don't think it does make it ok. There is a 'they' culture here. 'They will pick it up', 'they will clean up at the end', 'they should do something about it'. They is you, they is us. Take responsibility for your own actions and do what you know to be right. Take it home, recycle it, compost it, eat it for all I care, just don't leave it lying around and expect 'THEY' to deal with it.